Grab your friends, neighbors, kids, chairs, and wine glasses and come on down to the Wednesday evening Celebrate Woodinville concerts on August 1 and August 8 in Wilmot Gateway Park. Produced by the Woodinville Chamber and presented by The Everett Clinic in Woodinville, these are free community events where you can dance to the music, sip local wines, beers, and ciders, and enjoy tasty bites from local restaurants and food trucks. Take the shuttle – it’s relaxing and easy! Park at the Woodinville Park & Ride and our friends from Woodinville Martial Arts will drive you door to door, with a smile. Shuttle details: www.celebratewoodinville.com/location/parking. Wednesday, August 1 | Tribute Kings: This band shines with rock, country, pop and R&B hits that are fun for the whole family. All the hits, horns and hoopla make this show rock and will make you want to get up and dance! Wednesday, August 8 | Emily McIntosh: Woodinville’s favorite, this indisputably gifted vocalist will entertain you with soul, dance, contemporary, pop, hip/hop, smooth jazz and sultry R&B. We love Emily! It’s the place to be this summer! 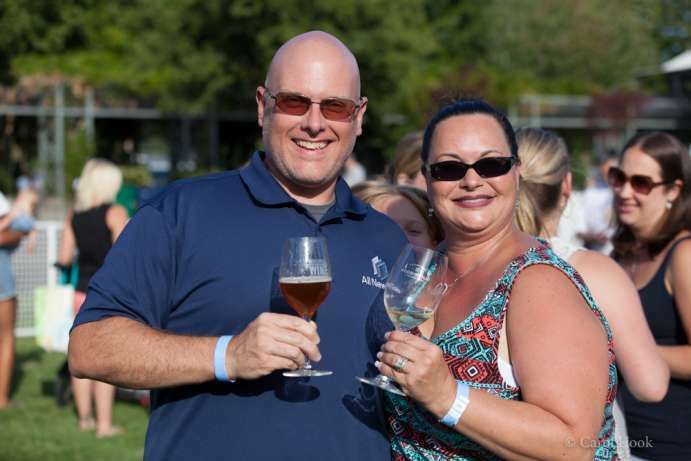 Find your perfect spot in the wine & beer garden, where you can purchase glass pours of wines from premiere Woodinville Wine Country wineries and tasting rooms, and pints of local craft beer and cider. Follow us on Facebook, Twitter, and Instagram, and visit our website at www.celebratewoodinville.com to find out when your favorite wineries, breweries, cideries, and restaurants will be on hand. Presenting Sponsor: The Everett Clinic, in Woodinville. Gold Sponsors: BECU, The Tania McLaughlin Agency of American Family Insurance, Washington Preparatory School, Westhill Inc., Windermere Real Estate Woodinville. Silver Sponsors: Banner Bank, Branches Church, Conover Insurance, The Creekside MBK Senior Living, Photography by Carol Hook, Soleil Orthodontics, Troy Real Estate Group, UW Neighborhood Clinics-Woodinville Clinic, Waste Management, Woodinville Martial Arts, Woodinville Weekly. Friends of Celebrate Woodinville: Cascadia College Bothell, Edward Jones Woodinville-Bert Mills, IRG Physical Therapy of Woodinville, Purple|The Commons, Real Living Northwest-Leslie McFadden, University of Washington, Bothell. Celebrate Woodinville is produced by the Woodinville Chamber, in partnership with the City of Woodinville, Woodinville Wine Country, and the Northshore YMCA. The mission of Celebrate Woodinville is to bring Woodinville residents together for family-oriented events, encourage a sense of community, and promote Woodinville’s wineries, breweries, cideries, local businesses, agriculture, and unique character to visitors from throughout the Puget Sound Region. Follow us on Facebook at www.facebook.com/celebratewoodinville and visit our website at www.celebratewoodinville.com for more information.